This week we look back on 2017 and because its easier, our OneBookshelf (OBS) sales numbers and maybe some things we’ve learned. On July 24th this year we put up the Enlightenment Gear book with Armor and Weapons for Pathfinder based off the Galaxy Pirates setting. As I mentioned in a previous article, we spent a lot of money on that book in art, layout and writing. Then we put it up on DriveThruRPG as a Pay What You Want title. We sold 9 copies in July and gave away 45, that’s 1 in 5 paying customers. As it was our first product there was some goodwill and friends of mine in there bumping the numbers. Our subsequent PWYW titles have gotten closer to 1 in 10 paying customers to downloaders. The purpose of giving away the book was to get some initial feedback on the book, six months later we’ve never had a review or a word of feedback on the title. Also due a change at OBS, free downloads didn’t count as much as sales for new hot titles so PWYW isn’t worth what it used to be for feedback OR as advertising. There are a lot of content marketing folks that tell you to give an amazing teaser and let it lead to sales of other products. We currently don’t run any of our supplements that way, but I have given the idea consideration. In July we created our Facebook page, twitter account and started to learn lessons there. The first lesson is that all 54 sales and downloads of the book came from internal referrals from OBS itself and not Facebook or Twitter. However the other lesson we learned was you need to tag all your Facebook and Twitter URLs with Source information so IF you get a sale from outside marketing you know which ad or post generated the sale. In August we had 137 sales, one of them came from Facebook but because I didn’t tag my efforts well back then, I don’t know if it was my post or another 3PP’s post that got them to the site. At this point Alien Archive wasn’t released yet and I didn’t have a copy of the Core Rulebook to convert the creatures to Starfinder. First Contact was out so you could kind of guess at things in the same CR. 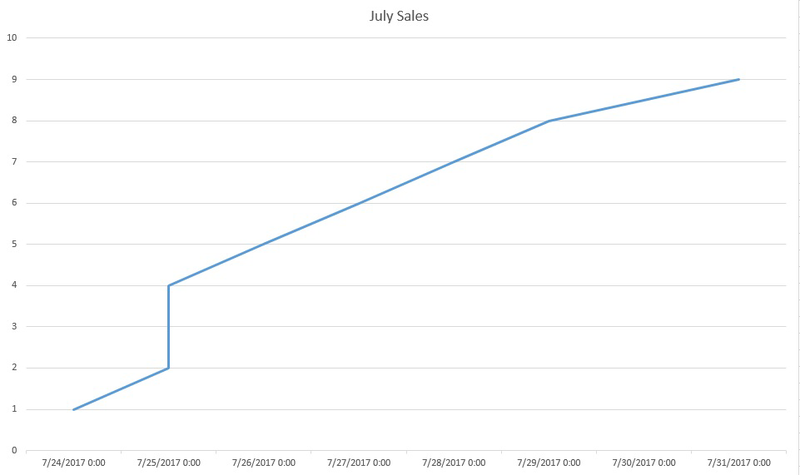 On August 17th GenCon 50 began and Starfinder sold out within hours of the convention opening, you may notice the spike in sales on the 17th from a trickle to straight up. 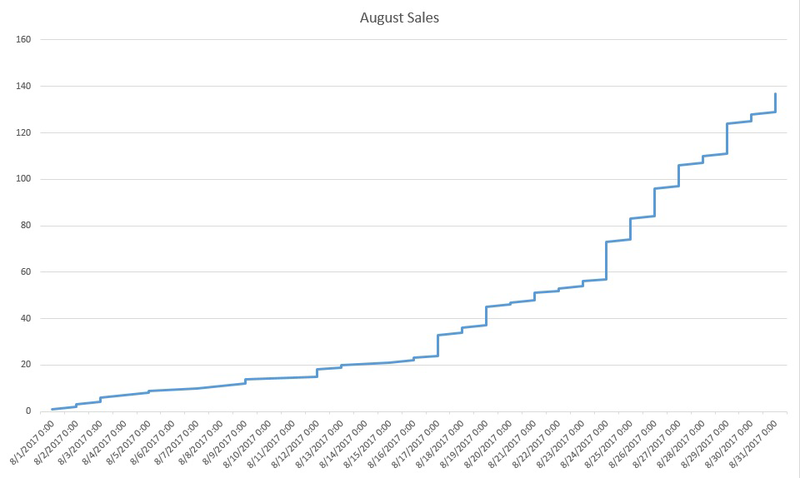 On August 18th Owen KC Stephens mentioned us on his Facebook page and we got another sales spike. Enlightenment sold 16 more copies. The thing you should know about the Heavy Fighter is it was designed to be the generic fighter of the Galaxy Pirates rulebook, we did some illustrations for dogfighting maneuvers and needed a generic fighter to put in those images. In August I saw a dearth of 3rd party starships and I statted it up with a big gun like an A-10 Warthog and it was our hottest selling title that month. 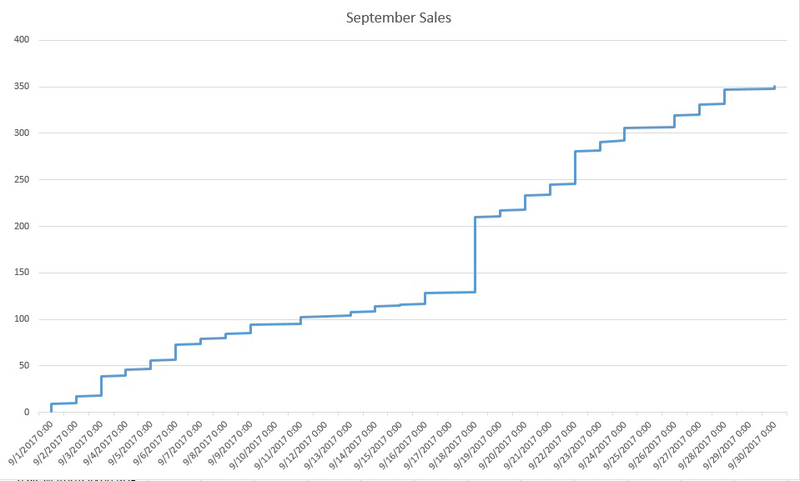 In September we had 351 paid sales. We had a funny thing happen, as we reached 12 total starships, people would come into OBS and buy them all 12 at a time. So on September 17th I bundled them as a single product, knocked $2 off the top and we sold 16 of those after it became a package deal. We sold 6 of those bundles the next day, someone also bought the 12 files individually as well. We released some giant robots, and added ten more booklets to our lineup, most of our starships logged another 20+ sales that month. There were a lot of folks converting monsters from the Pathfinder Bestiaries, but there were not a lot of starships out there. People wanted starships and starship deckplans seemed to be the most in demand. Deckplans like other custom art aren’t cheap. A lot of the initial investment in layout hours got absorbed of the twenty products in our catalog and I was doing some simple InDesign work by then. The little bit of InDesign I was doing helped us iterate products faster. 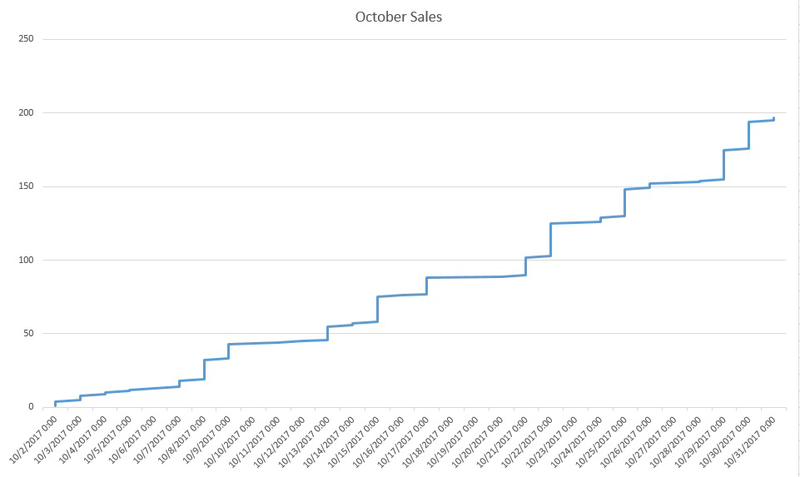 In October we had 198 paid sales. I tried to do something different with the starships, a starship normally only had one Tier and if the Party’s APL wasn’t within one or two levels of that starship, it wasn’t useful to a GM running a game. I wanted ships with templates like monsters that could cover a wider range of Tiers. I used some stock art and put together 4-6 stat blocks per ship and the fighters and shuttles that came out of this experiment became our new standard for a minimum viable product. October also saw the release of predetermined sensor readings for Science Officers based on the 12 ships in the Core rules book. We released it as PWYW and there were 113 total downloads, 20 paid purchases or about 1 in 5. 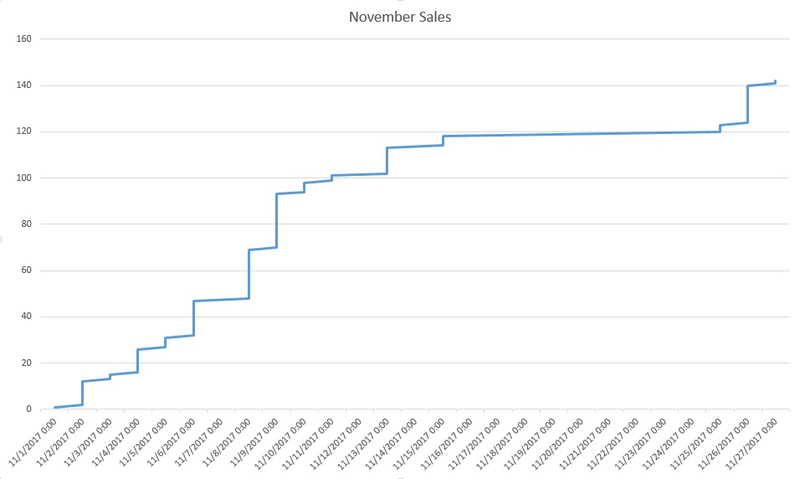 November was slower, we had 142 paid sales. The ten days from the 15th to the 25th with no sales kind of wrecked my confidence. 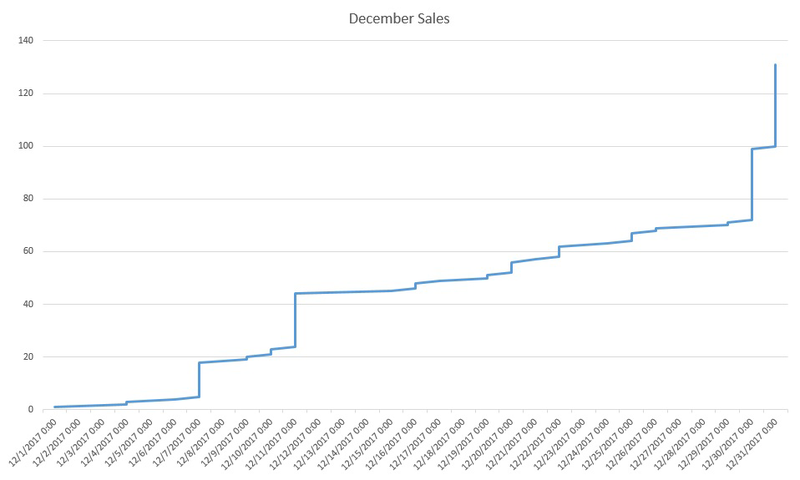 December we had 132 paid sales, initially it looked like it was going to be half of what November was, but I finished out our second dozen starships, created a new bundle and after telling the world about it, we saw a spike in sales of the original bundle and other back catalog titles. We didn’t sell a single copy of the new bundle in 2017. We did receive our first review at OBS, customer asked for clean art he could show his players instead of the cover art with logos and such blocking the artwork. I added the clean artwork to an existing product the Pirate Fighter. He also wanted an image he could use to make pawns, I added 7 sets of front and back pawn images to the file and uploaded the changes to OBS later in the afternoon. I’ll be working to add similar changes to all our starships, especially smaller ships like fighters and shuttles. In 2017 we had 969 paid sales, of those 31 came from Facebook posts and 13 came from Twitter so while its not a lot compared to people who came to us from internal recommendations on the website, its FREE so you should probably still do it. Tag DriveThruRPG in your tweet and you may get a retweet in front of their 16.5k followers, which is wider than my 24 followers, which lead to 13 sales, but again FREE, so do it. In 2017 I paid Facebook $33 to advertise in the US, UK and Canada to the Men and Women, 18-55, with an interest in the Pathfinder RPG. 31 sales that I know came from FB, none of them were tagged with the Source of my FB ad. $33 spent, 2,694 people reached, 152 likes, shares, link clicks and not one verifiable sale from a FB Ad. Now a lot of my booklets are $0.99 so Facebook ads while cheap don’t have much return on investment for me. If I had a more expensive book to sell the math changes. I used OBS Banners and Featured product placement out of 5,000 impressions on DriveThruRPG and RPGnow I got 119 clicks or 2% click thru rate and I don’t believe any of those lead directly to a sale. We did 20,000 impressions n the banner for 86 clicks and no direct sales that I’m aware of. However they’re FREE so you should at least consider it. So if anyone were to ask me what the best way to promote your products is, keep releasing new products, keep your brand in new releases list and people looking at your new stuff will also go buy your old stuff. Out of 969 sales, I personally got $575.97 of that, ~$600 does not cover the art costs of the 4 starships we currently sell that have deckplans. Some of the Minimum Viable Product MVP ships from October actually made enough money to pay for their stock art. So it seems to me that we need to have a mix of small budget and large budget products as well as ways to repackage our content to spread some costs over multiple projects. The other thing is I need to work out is if $0.99 is a sustainable pricepoint for the big ships with deckplans. I pay Adobe $19.99 a month for InDesign and I believe the flexibility it gives me in iterating new products or revising old ones is absolutely worthwhile. If I had a slower release schedule with bigger books going to dedicated layout folks, then my having my own copy probably wouldn’t be worth as much. Will we ever make it all back, I have no idea.